This is where our in-house team of innovative and design specialists create a dramatic design for your event which exceeds all expectations. With an endless array of products we can create a combination of stage sets to make any configuration riser from the basic 4x4, 4x6 and 4x8 to a custom multi level theatrical stage for any conference meeting or performance. We have a wide selection of in house furniture from stools, executive chairs, swivel chairs, cocktail and water table to make any conference event or party a success. 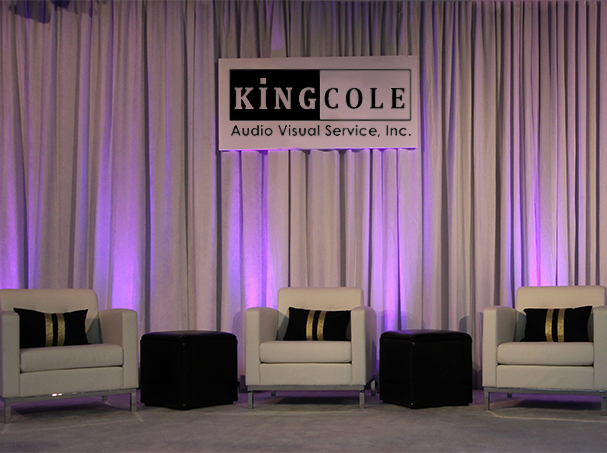 Choose one of our many open "ready to go" set elements, including backdrops, monitor surround, screen surround, kiosks and registration desks. Elevate your brand through the use of custom hard sets designed specifically for you.